The WASH 1,000 Methodology: SPRING/Ghana builds on and enhances standard CLTS methodology by incorporating four nutrition-sensitive WASH behaviors into CLTS activities, creating a “WASH 1,000” focus. continue the motivation and social encouragement for positive behavior change established through CLTS. Create clean play spaces for children by separating the spaces from soil and animal feces. Wash hands at appropriate times: a) before and after feeding, and b) after latrine use. Provide safe drinking water for pregnant women and children 6–24 months. Appropriately dispose of adult and infant feces in a latrine. Achieve broader stakeholder interest through involvement of traditional WASH actors (Ghana Health Service, district education offices, WASH committees, and natural leaders) and mother-tomother support groups and school health clubs. Increase frequency of messages by employing a variety of social and behavior change communication channels and leveraging existing structures, such as radio spots, mother-to-mother groups, community video, natural leaders, and school health clubs. Link WASH behaviors to growth of 1,000-day child by using child health record charts. Conclusion: Mounting evidence demonstrates associations between WASH improvements and stunting reductions. Lack of sanitation, in particular, is strongly correlated with stunting. 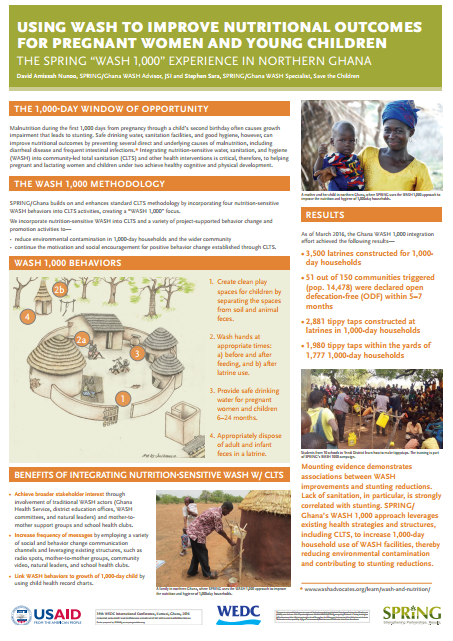 SPRING/ Ghana’s WASH 1,000 approach leverages existing health strategies and structures, including CLTS, to increase 1,000-day household use of WASH facilities, thereby reducing environmental contamination and contributing to stunting reductions.